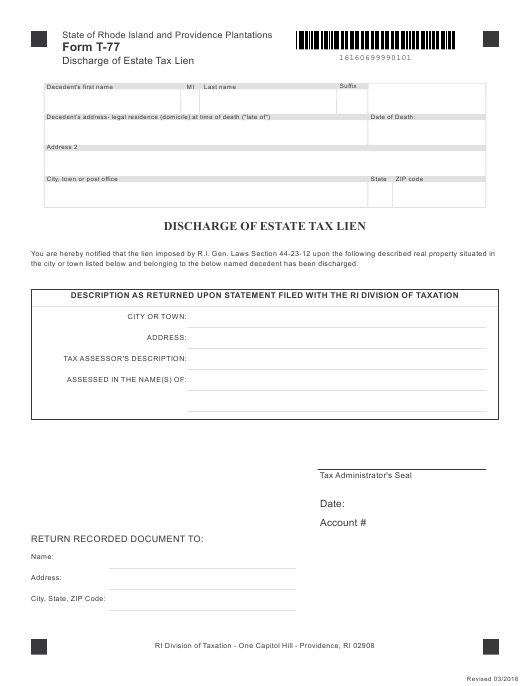 Form T-77 or the "Discharge Of Estate Tax Lien" is a form issued by the Rhode Island Department of Revenue. Download a fillable PDF version of the Form T-77 down below or find it on the Rhode Island Department of Revenue Forms website. the city or town listed below and belonging to the below named decedent has been discharged. Enter the full name of the deceased along with the deceased's complete address at the time of death. CITY OR TOWN means the city or town where the property is located. ASSESSED IN THE NAME(S) OF means the names as listed on the property tax bill. LATE OF means the city or town the person resided in at the time of death.